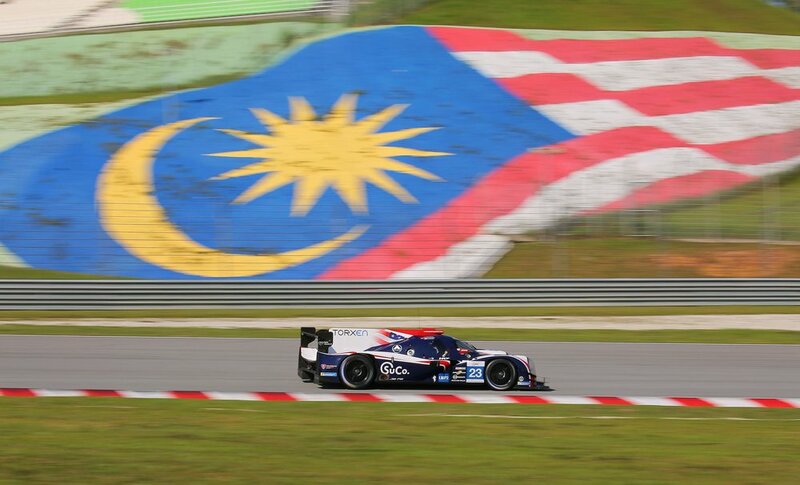 Cosmo, Byrne & Yoluc Secure 2nd in Asian Le Mans LMP2-Am Championship, Miss Victory at Sepang with Broken Gearbox — Cosmo-Sport, Inc.
Patrick Byrne (US)/Guy Cosmo (US)/Salih Yoluc (TUR), were set for a solid third place overall and a second LMP2 class win in Malaysia today but with 32mins, a gearbox issue caused the #23’s retirement and so cruelly missed out on the LMP2 Am title by 34 points having led this title race until the penultimate round and posting two class podiums – including one class win – plus an overall podium. In LMP3, #2 Wayne Boyd (GB)/Chris Buncombe (GB)/Garett Grist (CAN) earned United a 100% class podium finishing record in the four-race series – like the LMP2 #22 Ligier of Hanson/Di Resta. Third place gave #2 second place in the final standings – 17 points behind the winners – with the sister Ligier #3 of Matt Bell (GB)/Kay van Berlo (NED)/Jim McGuire (US) claiming fourth in the final table after finishing fifth in the 4Hrs of Sepang today staged in searing, unrelenting heat. United claimed an outright or class podium finish in all four races amassing a total of four overall or class wins. United, which has contested the world-famous Le Mans race for the past two years achieving fourth (2017) and third (2018) place LMP2 classified finishes, now focusses on its European Le Mans Series campaign which begins at Paul Ricard in France (12-14 April). United won the LMP3 title on its ELMS début in 2016, finished second in its maiden LMP2 2017 season also winning LMP3 again that year. 2019 also sees United beginning its first full FIA World Endurance Championship season in August. With the ambient temperature once again above 30°C, #22 (HAN) started from the front-row for the third consecutive race, with #23 (BYN) going from second in Am class (P6 overall), the Ligier having been plague by a mysterious electrical issue on the opening day. #22 ran P2 in the opening laps but took the lead 14 minutes into the race when the pole-sitting #8 was adjudged to have jumped the start and was given a penalty. #23 ran second in Am class (P6 overall) despite also serving a drive-through for an indiscretion heading to the grid. At one-quarter distance and following all opening scheduled pit-stops, #22 and #23 were placed P1 & P6 (P2 in Am), Hanson with a 45 second advantage with Yoluc now in the #23, 13 seconds adrift of the Am leader. With almost 90 minutes on the clock and #22 with a very healthy 51 second lead, the Safety Car was deployed with a car momentarily stationary on the track, #22 & #23 both pitting, resuming P3 (#22 DIR) and P4, P2 in Am (#23 YOL). #22 & #23 lay P2 & P4 overall but now leading Am at mid-distance despite a spin and a second drive-through penalty (Safety Car infringement). Hanson was back in #22 with 102 minutes remaining, Cosmo taking over #23 moments later, #22 remaining P2 – 22 seconds adrift of the race leader – #23 P4 overall and still ahead in the Am class before another Safety Car, lasting 13 minutes, with 90 minutes left on the clock. The race resumed with #22 P2 and #23 P3 overall and leading Am, the positions remaining constant until 32 minutes from the finish when #23, placed a comfortable P3 overall and a solid P1 in LMP2 Am, suffered gearbox problems and subsequent retirement. Hanson incurred a 20 second time penalty at his stop for an earlier pit-stop infringement while Di Resta, in the #22 for the final 14 minutes, took the chequered flag 103 seconds behind the winning #24.